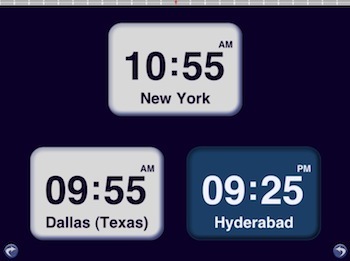 We have mentioned WorldClock before as a method we use to keep track of times across the offices around the world. Handy to plan when teams are available for work effort. One of our coworkers has kids that use it for knowing when their social friends around the world will be talking about their days or evening activities. Scrolling around the world quickly shows how long to go till optimum time for chatting. 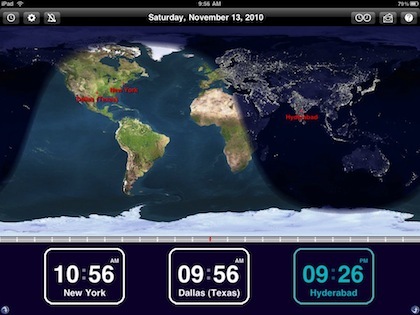 The latest update to WorldClock has brought developer tuning to take advantage or iOS4.2 on the iPad and nice customization options to get your world view as you want to see it. First the tuning, then the views. 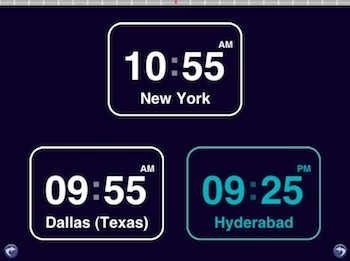 Choosing which city clocks and adjusting their local times is much improved and quicker to tune to what you need. Making it easy to add/remove cities when the need changes. 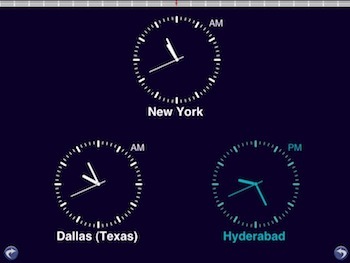 A view of the world is provided with clocks for the chosen cities (which are also called out on the world view). 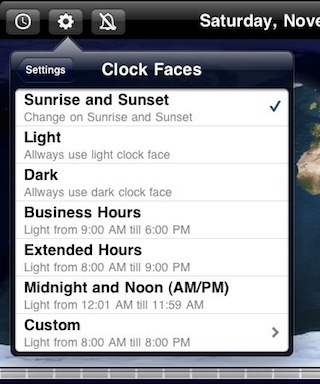 Choose from a few to many clocks, so you can see at a glance if you should expect to hear back when you send an email. 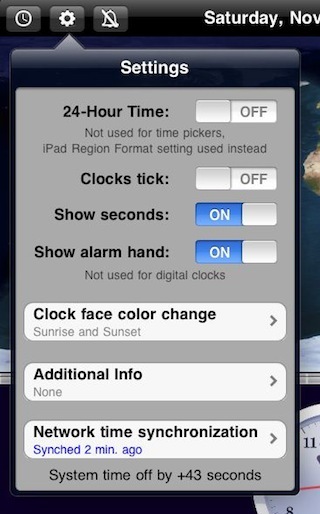 All of the adjustments, options, alarms and even a built in ‘help’ is through buttons along the top of the WorldClock screen. Tapping the small buttons on the lower right or left corners of the screen causes the clock faces to change. 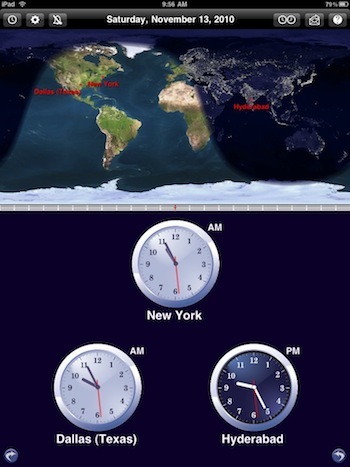 Above is the default and below is the many views WorldClock offers. The digital views have parts that can blink on the second if chosen since there is no sweep second hand like on the round faces. 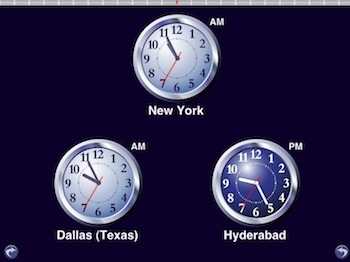 Of course WorldClock works well in landscape view. Important when the iPad is sitting on the desk doing nothing other than being an important supplier of information. Version 3.0.1 • iOS 4.2-related and general bug fixes; Russian localization added. 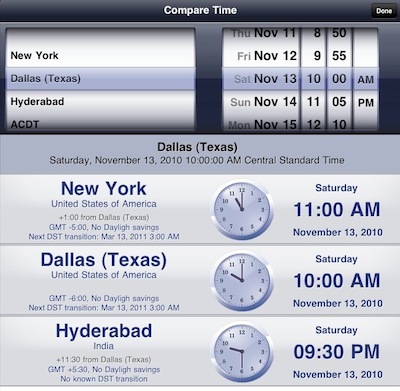 • Compare Time window with support for the selected locations plus 40 time zone abbreviations. 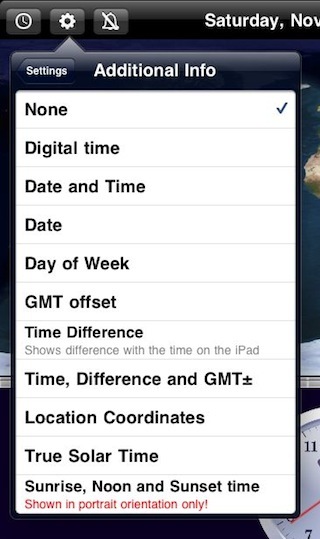 With iOS 4 – an option to add a calendar event right from the Compare Time window. • Performance and memory usage improvements, bug fixes.